Like the Marlin, they follow the warm currents, the Gulf Stream in the Atlantic and the Agulhas Current in the Pacific and have almost the identical distribution of Marlin. They are found as far North in the Atlantic as Cape Cod and down to the tip of South America along the waters of Bolivia, Argentina and Chile. In the Pacific they span most the waters of the Indian & Pacific Oceans. They are long and narrow bluish gray or brownish gray in color and have a characteristic erectile dorsal fin known as a sail, which stretches the entire length of the back. The dorsal fin or sail is normally kept folded down and to the side when swimming, but it may be raised when the Sailfish feels threatened or excited, making the fish appear much larger than it actually is. They can appear in a startling array of colors, from subdued browns and grays to vibrant purples, blues and even silver. The Sailfish can rapidly turn its body light blue with yellowish stripes when excited, confusing its prey and signaling its intentions to fellow Sailfish. Their body colors are often highlighted by stripes of iridescent blue and silver dots. Sailfish can change their colors almost instantly, similar to cuttlefish, all controlled by their nervous system. Sailfish can also use their versatile dorsal fin and ability to change color to hunt as well. They are prized game fish and known for their incredible speed, but they are also great jumpers. Sometimes they are spotted skimming across the water jumping to remove parasites or attack fish. Some think they just like to jump to show off. They frequently give away location by jumping as they can be spotted at a distance with binoculars making them easier to locate than other billfish. Both species of Sailfish are almost identical, again we are anglers, not scientists so for our intents and purposes we will not distinguish between the two. They grow quickly, very quickly reaching 3-5 feet (1–1.5 meters) in length in only a single year. Generally, Sailfish are smallish in the 50-100 lb. (25-45 kg) range and do not typically grow to more than 6 feet (~2 meters) in length. They are believed to have the ability to reach 10 feet (~3 meters) in length and reach a maximum weight of about 300 lbs. (135 kg). The Pacific Sailfish seems to be the larger of the two at least by records and speculation. They are typically surface feeders primarily eating squid, octopus, mackerel, mullet, flying fish, needlefish, and any other small fish they see and catch. Their habits are not unlike Marlin species. Although they travel in deep water, they almost never feed there. Sailfish will usually feed on the surface but frequently hunt in mid-depths around 30-60 feet (~10-20 meter) as well. Sailfish can exhibit the same group hunting characteristics as its cousin the White Marlin, in which they ball bait as a co-op and take turns feeding. We mentioned their ability to change color and flare their large dorsal fin. Sailfish use these skills to confuse prey and signal each other when hunting cooperatively. It’s awesome to see, especially in clear blue water. Since commercial fishing for Sailfish with nets has been stopped, they have returned over reefs in Key West and seem to be flourishing everywhere. The same methods of fishing for Marlin are used for Sailfish as well. That being said an over-simplification of the most common and probably the best way to fly fish for Marlin is the bait and switch method. This is done by various different techniques but again the over-simplified version is this. Scare them up. By dragging teasers behind the boat, making bubble trails, noise and flashes of light and color. They like this and it stimulates them creating a hot spot of aggregation. You attempt to get them chasing a teaser, remember we said they are fast; they can easily keep up with the boat. You then cast a carefully placed fly to them either in front of or behind the teaser while the mate removes the teaser. Again, I can’t stress this enough, it is a gross over-simplification, but the basics of fly fishing for Marlin. 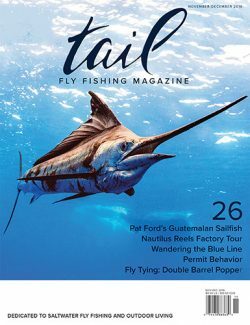 Some tease with bait or cast live bait to them to get them into range of a fly cast but honestly, we have little experience in this method but can say it has worked for Sailfish in the Florida Keys. If you are a lucky angler, there’s always the hope of encountering a bait ball and being able to cast directly into the action as well. This is what you hope for, sometimes it’s better to be lucky than good. Flies most commonly used are on hooks from 2-0 to a 6-0 and are mostly bait fish, squid, octopus and poppers.